To be censored or castrated. From the surname of Tuo Zhen, propaganda chief of Guangdong from May 2012 to July 2015, and current deputy chief of the Central Propaganda Department. Journalists and editors at Southern Weekly protested in January 2013 when Tuo bowdlerized the liberal Guangdong journal’s new year’s greeting, turning a call for constitutionalism into a banal piece of propaganda. Protesters called for Tuo’s resignation, revealing that over 1,034 Southern Weekly articles had been slashed under his watch. The journal eventually negotiated a truce, but later turned its back on some protesters. “Shuowen Jiezi“: Tuo—Originally a device used for castration. During the time of Wei Zhongxian, new palace eunuchs underwent the procedure in the imperial capital’s castration room. When the surgeon’s knife came down, patients would cry out “Tuo,” meaning that the cut was neat and complete (tuǒ 妥). 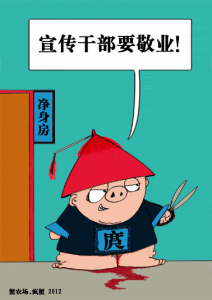 Later, “Tuo” referred to castration in general: pigs, dogs, and other farm animals were all said to be Tuoed. Today, Tuo also means delete, ex. Has your Weibo [account] been Tuoed?